For my settings: I have turned off my extruder fan for the first 4 layers. Bed temp is 60C, printing at 200C. I don't have an enclosure on the printer and I'm not sure if this is caused by temperature fluctuations? Any advice or setting that that should change? Thanks for your response everyone. I do think it could be due to the nozzle being too close. I'm going to try that first and go from there! Double check the Wood PLA print temp from the manufacturer,200 seems a bit low, a fair amount of wood PLA are up in the 220 range, it looks like under extrusion plus the first layer is a bit to close to the glass. Printing on glass is tricky, I have to wash mine with gloves on in Dawn dish soap, and dry with a paper towel to insure a clean surface so it sticks. If I run into issues I very lightly spray the glass with Aquanet hairspray (original variety) and it will usually fix any adhesion issues. Wash glass with soap and water, rinse and dry it, then DONT TOUCH the print area with bare hands or chemicals. Auto home, preheat PLA, disable steppers, move nozzle to several spots around the bed, carefully adjusting it so you can feel slight drag on a piece of paper when sliding it between the nozzle and bed. In your slicer, make sure the first layer is set to print about about .35 layer height. Put a thin layer of glue stick on print area, let dry for a minute or two. Print. Should be good if that's really PLA you are printing with. From you pictures, I can see you have a lot of bulging up from the bed on your first layer, this is caused by your nozzle being too close to the bed. I experienced the same thing on one of my printers some time ago. Re-calibrate your Z offset, then make sure you clean your bed with IPA. Use kitchen towel and water first if there is any residual glue on it. Your signature says you are using a Prusha clone. From the images you may have more than one issue. If the issue is only with this spool and other materials are printing fine.you may have a bad spool of material or temp corrections not set correctly. Create a matrix of recommended ranges. Find a small test print. Changing only one value at a time. Test till you find something that works. If problems with other spools of material. If you have a removable bed: Check to make sure you don't have anything under the bed, that maybe raising the bed. If a PEI bed clean the bed thoroughly with 91%+ Isopropyl Alcohol. Once a week with acetone. https://help.prusa3d.com/article/6Gtws6Yqjg-pei-print-surface-preparation. Try bed level correction to help: https://help.prusa3d.com/article/TPGip0OmaP-bed-level-correction-kit-only. His bed is not PEI, but I want to add my personal input that I don't think you should use acetone weekly. I've used the same PEI sheet that came with my printer for over a year. Isopropyl Alcohol is a good recommendation and should be more than enough in most cases. Frequent use of acetone is just going to wear out your PEI sheet unnecessarily fast. That's not to say there aren't times when you should use it. On the use of Acetone. The recommendation is from Prusha. "About once a week, or when prints stop sticking, use ACETONE to clean the bed. It removes grease better than IPA or Windex. It also rejuvenates the print surface. However, if you use acetone every day, PEI will become brittle and start cracking." Interesting. Didn't expect that. Still, I haven't needed it, so I'll continue as I am until I do. Frankly, you could continue to print this way. The printer will still print over the junk and give you the part you need. 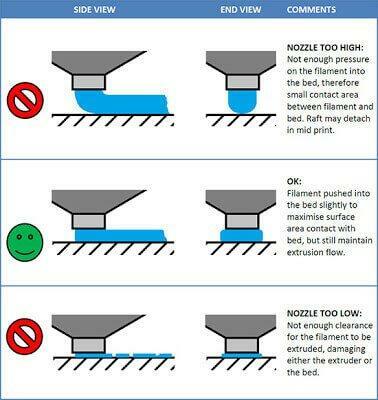 The way you have it should give good adhesion, but if you want to improve the quality, I think you should move the nozzle a little farther away from the bed. I can tell from your skirt it is really squished down. Some areas haven't extruded enough, and a lot of the lines have squished above the height of the nozzle itself, a sign of overflow/high pressure. I think the blobs are caused by pressure building-up, then releasing.